It’s hard to understand the need for The Indispensable Guide to Undergraduate Research if you aren’t aware of some of the gaps that the book is designed to bridge. Charity Hudley is one of the authors of The Indispensable Guide, along with Cheryl Dickter and Hannah Franz. All are associated with William & Mary: Charity Hudley is the Class of 1952 Associate Professor of English & Africana Studies. Dickter is an associate professor in the Department of Psychology, while Franz is completing her Ph.D. in the university’s School of Education. The authors all are involved in WMSURE — the W&M Scholars Undergraduate Research Experience. Charity Hudley and Dickter are co-directors, while Franz serves as WMSURE graduate assistant. The basic idea of WMSURE is to make sure that young scholar-researchers, especially those from underrepresented backgrounds, know how to get the most from a university education. The Indispensable Guide essentially bottles and exports best practices learned through working with students in WMSURE and other academic areas. The basic idea is to show students how they can become involved in the scholarship and research performed by faculty, but the authors point out that students miss the trailheads of the paths to research because from a new-student viewpoint these entrance points are often overgrown by the underbrush of academic culture. “So we start at the beginning,” Charity Hudley says. She gave the example of faculty office hours. The concept of “office hours” is a literal no-brainer for a university professor: write them on the board, make sure they’re on the syllabus, etc. But experience with WMSURE has shown the authors that students don’t always matriculate with a full understanding of faculty office hours. Dickter is an affiliate faculty member of the university’s neuroscience program. She is active in several research initiatives, including labs devoted to studying autism as well as social cognition. All of her labs involve undergraduate participation. Her web site contains a contact link for potential undergrad researchers. Like many William & Mary faculty, Dickter will seek out a particular student from a class, but she said WMSURE has been an excellent tool for making connections between research opportunities and students. 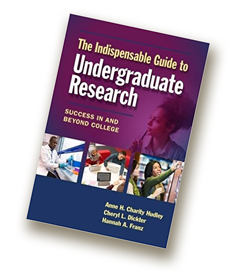 All universities may not have an equivalent of WMSURE, but Dickter says The Indispensable Guide suggests students seek out the school’s undergraduate research program. And, she said, one of the best entry points is a conversation with the professor. The Indispensable Guide offers a set of questions and discussion points. Franz is a 2007 graduate of William & Mary — Charity Hudley was her thesis advisor. She taught in the K-12 world before entering the Ph.D. program at William & Mary’s School of Education, and brought her understanding of “what doesn’t get taught in high school” to The Indispensable Guide. One important concept, she said, is the difference between teacher and professor. Franz said the book’s core audience is college-bound high schoolers and first- and second-year college students, but the authors stress that the book is valuable for a wider group. University faculty, they say, could benefit from the insights The Indispensable Guide offers relative to the challenges faced by new students who are eager and intelligent, but don’t quite know “how to college.” It could serve as a text for research methods courses, as well. The authors say that The Indispensable Guide fills a rather large niche in educational books and they’re seen evidence of demand beyond the core audience. They discussed the book at Autumn Blast, William & Mary’s annual event for multicultural high school seniors and their parents. But the book is out now, not only on Amazon, but also at bookstores.